Not all hikes are created equal. As much as we want to tell you that x shoe is the be all, end all of shoes, there is no one-shoe to suit all purposes. 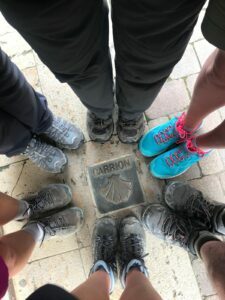 The shoe that Aaron wears trekking through bog and scrambling up the back side of Carrauntoohil, is different to the shoe that Aoife wears for an afternoon in in Glendalough. Neither are anything like the shoe Alan might take overseas to spend a week walking on the Camino. Not only are Aaron, Aoife, and Alan all doing completely different kinds of walking, but they all have different shaped feet! Even if they were hiking together on the same terrain, Aaron may have burly feet that suit a certain shoe, Alan’s may be more slender and might suit an entirely different one. If you’re not too sure how this works, we’ve got a blog that’s all about shoe fit here. The first step is to figure out what activity you’ll be doing. If you’re on a tight budget, just ask yourself- what kind of activity will I use these for the most? Just because you may need a stiff heavy-duty boot for a rare trip somewhere more extreme doesn’t mean you should be doing all your trail walking in it. While it might be a dream walking in Italy with an ultra breathable trek sandal it may not suit you 99% of the time in Ireland (they tend to be quite leaky). The majority of walkers in our mountain areas will find that their requirements fall somewhere in the middle of these two extremes. Here are few questions our footwear staff tend to ask customers. When considering your next pair of boots, what do you need to know? Are you traveling to warmer climates? Will you be stepping in puddles or crossing rivers? How fast will you be moving? Do you need something lightweight so you can cover more ground? What kind of ground will you be walking on? Pavement? Gravel trail? Mucky trail? No trail? The tougher the terrain, the tougher the boots need to be! Will you be walking over ice and snow? Do you need a boot that can take crampons? If you have a good idea of the terrain you’ll be covering, the next step is the good part- what kind of shoe do you need? The small layer of fabric and leather that covers your ankle on a boot (as opposed to a shoe) isn’t nearly enough to support your weight, it’s only there for warmth and waterproofing. When you go over on your ankle, it’s actually because the shoe (or boot) isn’t holding your heel stable. If you have a sole that is stiff enough to stop your heel from rolling around, your ankle will have plenty of support from the ground up. So what is the fabric over the ankle there for? It allows you to step in deeper puddles, and prevents moisture from long grass getting inside as easily. We recommend a shoe over a boot for warm climates though, as heat and moisture can escape a shoe much more easily with less distance to travel. Those seeking extreme breathability might look into getting a trek sandal. We like to recommend a Trekking boot (or a light hiking boot) for this. These tend to be heavier than a trek shoe, but can often have a slightly stiffer sole unit as well. This gives you more stability on rocky ground, and for carrying loaded rucksacks on shorter backpacking trips. The higher ankle, as mentioned above, doesn’t add to the support of the boot, but moves your waterproof line further up the boot. This is great if you’re moving off track through wet grass, crossing rivers and streams, or just stomping in deep puddles. We’d usually recommend a light hiker as an “Irish all rounder”. It won’t kill your feet if you spend the day on pavement, it’s perfect for getting out and exploring trails, and the extra waterproofing comes in handy because, sure, we live in Ireland. Where you’re going, you don’t need trails. Just park the car and start walking. You’re moving into more serious terrain and you need a more serious boot. A hiking boot is perfectly suited for extremely uneven terrain. The stiff sole means that no mater what you step in, your foot, heel, and in turn ankle stay grounded on a flat surface. This added stability is a lifesaver when taking on precarious ridges, or really anything short of vertical climbing. The extra stiffness helps you carry a loaded rucksack on a multi day trek. Most of the boots in this category can take some kind of crampon if you plan on doing some walking in wintery terrain. Boots in this area tend towards the top of the price range. The quality of construction and the fact that they are usually hand made in quite small numbers means that for most hill walkers these are the most expensive boots to purchase. 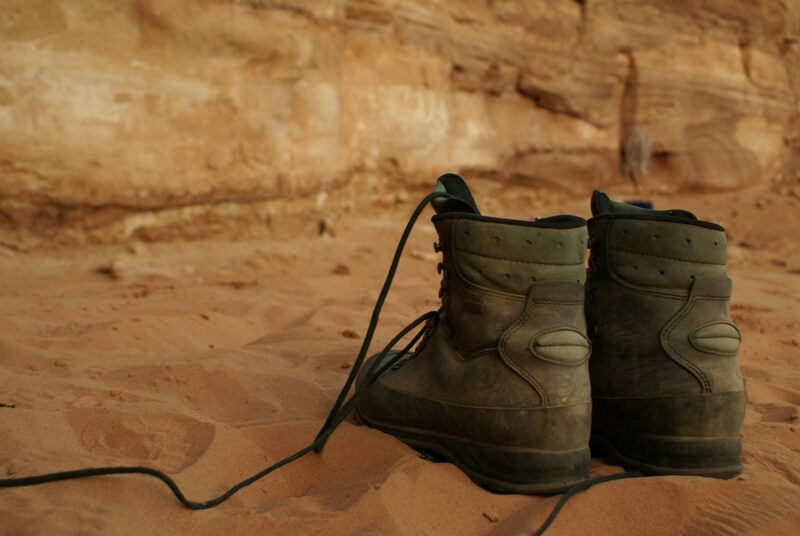 However, lots of our hiking boots are re-soleable, making them longer lasting. Look after them and they’ll look after you! But buyer beware. If you intend on taking a heavy hiking boot over pavement, or forest trail you might not benefit from the extra stiffness and weight. This can make you feel tired and uncomfortable at the end of the day. If you are planning a lot of off trail vertical, winter walking, or multi day backpacking then these are a quality investment- however if you just want to look a bit more rugged during a summer ramble then you might want to think again. The North face of the Tour Ronde or Ben Nevis. Mt. McKinley or the summit of Everest. If these destinations are on your to do list and your preferred way of traveling involves as much vertical as horizontal, then you will find yourself looking at full on mountaineering boots. These are characterised by their extreme rigidity. The sole unit is designed to have almost no flex. 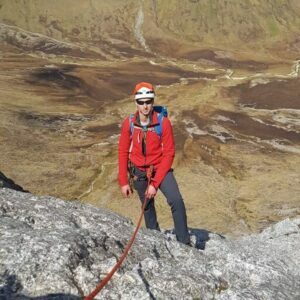 This allows secure connection to crampons, and the best positioning on small footholds. While the upper is often built up quite high on these boots, the ankle is usually articulated and made to be a bit more flexible in order to allow more precise footwork on rock or ice faces. Although these are used to march in on expeditions and for access to routes it is important to remember that they are not “walking” boots. Using these for general hill walking around the west of Ireland is akin to using a tractor for motorway driving. It is possible but hardly comfortable or efficient. That said, for the top of the world, you need top of the range boots. It sounds like you’re thinking about taking up Trail Running. A trail running shoe is similar to a road running shoe in some ways, but totally different in others. A trail runner will typically have a stiffer sole than a runner, because you’ll need extra support going over uneven terrain. Even if you don’t plan on running, the added stability can be grear for a brisk trail walk. Trail Runners are constructed to allow water to drain from the shoe if you step in a river or deep puddle, so most aren’t waterproof either. They are made super light as well, to keep you nimble. But the biggest difference between runners and trail runners? The lugs. A trail runner has bigger, stickier lug construction on the sole of the shoe. This means you can grip mucky, loose terrain much easier. Shoes like the Inov8 Trail Talon have a combination of hard and soft lugs, with a midsized depth. Great for everyday running on grass and forest floors, and maybe some pavement running too. Shoes like the Salomon Speedcross on the other hand have big spread out lugs, perfect for mucky running. All technical trail runners are quicker to wear down than road runners, especially on harder trails and pavement. It is important to remember that shoes and boots are simply a part of a system that starts with your own unique foot. Good fit makes all the difference, and the best fit will give a boot it’s best performance, the most comfort, and the greatest durability. The choice of quality sock is a huge factor in comfort and nowadays there are so many good socks available on the market. There’s simply is no reason to venture outside wearing any old football or cheap cotton sports socks. Quality insoles which support, cushion and stabilise the foot also make an enormous difference, and can be moved around shoes and boots to provide consistent levels of support and comfort. Adjusting the volume and shape of the boot is the final part of the fit process, and our team can help guide you through this journey. Swing in to our Dublin city centre shop and have a chat with our footwear experts about what kind of shoe or boot you are after. We can help you with the final piece of the puzzle, getting a boot or shoe that works with your feet. After all, the best boot on the wall is the one that fits!